A dark and moody image please, it could be anything from a landscape to a portrait to a still life to an architectural shot and not limited to those genres, but let's see something that is wrapped in darkness; something definitely "low key". Images can be new or from your archive, but as usual must be shot on Pentax. Dark and Moody, or very Low Key; sumptuous blacks, deep shadows; these are what I had in mind when setting this subject. And I have been delighted to see such a wide variety of fine examples – the more difficult they make to choosing of the winner the better, it means the standard is very high. Storm Brewing by tyronet2000 – The mood is most definitely there. I am a bit disturbed that there seem to be two horizons, unless the one top right is a distant mountain. But it looks like a hill. So there are competing elements in the image. However, the effect is strong and exactly the sort of thing I was looking for. Condor moment by Perspicador – We don't see many smoker images these days, but in fact smoking can add something to a portrait image. This image is very soft, fitting in with the nature of the Condor moment. Perhaps focus on the eyes could be considered, or, alternatively, focus on the glowing end of the cigar or pipe. Another satisfyingly moody shot. Winter gloom by smudge – In my quest for gloom, my thoughts lead me to wanting to see more of those gloomy under the arches areas. I'm sure in those shadows a picture was waiting to be made. The bright sky does however depict winter sun very well. After the rain by Nigelk – Yes, dark and moody, I love the rain. Why not darken down the far distance though, lest the line of the dark walls should seem to lead us towards the light. Personally I would go darker still with this, but I'm always conscious that it's your picture, so it should say what you want it to say. Storm Brewing by pipinmels – Dark clouds and distant mountains, but for dark and moody it is unfortunate that it promises a hint of blue sky. Otherwise, it's a fine picture. The Haunted Bedroom by EricD1306 – Now this reminds me of the classic black and white image called “Fading Away” - a very dark and moody photograph that is worth looking up on the web. This one is trimmed back and a haunting encroaches indeed. Yes, this hits the spot and fulfils what I had in mind very well. Moody Storm by JudithAnn – This full of atmosphere, but the red central portion speaks to me more of warmth and light breaking through the centre of a storm that is passing, rather than something dark that is pressing in around us. Again, a great image that isn't quite making the theme of the competition. Whitby Abbey Headland by JAK – There's no doubting the technical ability of the photographer, I'm just thinking the green bias to the colour is rather bizarre. It would work if used to illuminate the features of someone, especially perhaps the features of one of the actors who perform Dracula around the abbey. As it stands, I might be inclined to try blue rather than green. Night Time at Didcot by Lancashire Lad – A powerful monochrome interpretation of the theme. I suggest cropping some off the top of the image, which then enhances the feeling of darkness. 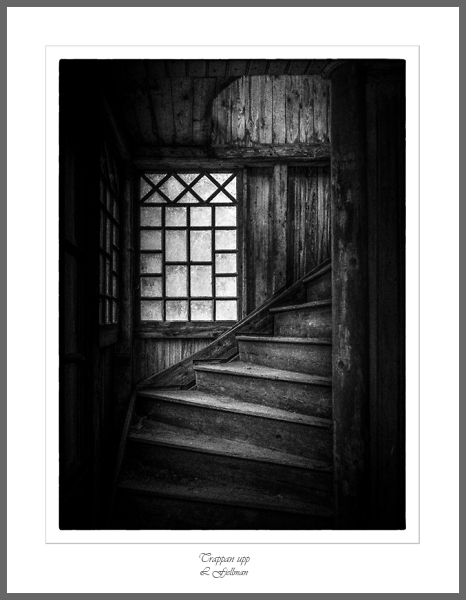 Stairs by Larseric – Excellent, another picture that fits the brief extremely well. I love all the dark wood, full of texture. Solitary Boat by retsoor – We can weave a story around this one, as we walk through the darkness and then come across a lonely hut and the solitary boat. What mysteries are here cloaked in the shadows? Full Moon by davidwozhere – Another shot that invites us to exercise our imaginations. Plus the full moon, shining its silver glow over the scene. Very effective. Dark Square Root by coker – It is an effective, dark still life image, but I'm less sure that it gives us any particular mood to go with it. Good image making. Il Commendatore by Abe_Normal – The whole idea is right, but I think it needs a different background, something more in keeping with its menacing nature. I'd keep working on this, it has something about it that is worth pursuing. Menine Straits by paulb531 – An effective end-of-day image, evoking that special peaceful feeling as the sun sinks. Storm Brewing by noelcmn – Storm light is fantastic, this one has an interesting foreground as well. I would prefer the buildings to have been a bit sharper, but the overall effect holds good. Sunrise on the Solway by johnwnjr – A gorgeous sunset, a moody end to the day. Excellent composition. Is Anyone There by ken2390 – The mist is a great idea, it's indeed dark and moody. I think it would have clinched it if something had been vaguely looming out of the mist, rather than the rather random building bottom right. But the principle is good. So those are my thoughts and do please remember that although not everyone can win, all the images were of an excellent standard, so hopefully we should all be encouraged by that. The winner, for the dark, moody and very precise composition, is Larseric, with those fine Stairs. I wonder what haunted house they belong to? And now Larseric, please follow the link in the Private Message you'll receive and start your new competition. The you'll need to judge and choose a winner. Any problems, please let me know. Second goes to davidwozhere for Full Moon. Third goes to EricD1306 for The Haunted Bedroom. Highly commended awards to perspicador and restoor. Fantastic shots all round. Many thanks for entering and have a great Christmas and New Year! Congratulations to the Winner and other podium places also the highly commended and commended. Thanks to John for the interesting subject, the judging and the comprehensive comments. Have to agree, this was a high quality challenge, so many interesting and varied interpretations of the theme. So it is a hearty congrats to Larseric, a fabulous shot, that it is B/W has only served to enhance the impact. And congrats extended to davidwozhere and EricD1306, and not forgetting the very highly commended johnwnjr and the two HC's Perspicador and Restoor! Thanks to our judge, johnriley, super challenge, super CC's. Great stuff all! Congratulations to Larseric for your first place and to davidwozhere for pipping me to second place. Also, to everyone who was either Highly Commended or Commended. Just as a follow up to my photo we had a weekened at Littlecote House Hotel at the beginning of this month and whilst there went on a tour of Littlecote House, which is well worth doing if you ever stay there. This photograph was taken in the entrance of what is known as "The Haunted Bedroom". Thanks to John for the prompt adjudication. Congratulations to the winner, Larseric, the podium places and the HCs. Thanks to John for an excellent competition with some great entries. Congratulations to Larseric a worthy winner. Well done the podiums and HC's, cracking winning image. Thank you John for the interesting challenge, the original title I gave my image was"Towards the Light"
This is speculation, but if John is away, is anyone else with the brief to chase for the setting of the next competition? Are you onto this, Larseric? Who said John is away? It's unfortunate we have a delay, but it has coincided with Christmas, so we'll have to be patient for now. Larseric has been sent a message and just needs to pick it up and follow the link. Now that we're almost beyond Boxing Day it's time for the usual reminder. Ho ! I don't feel (quite) so guilty now. Congratulations to Larseric and to Eric and thank you for the second placing which makes a nice Christmas present. That haunted bedroom is super.